Sometimes, it’s the little things (like more efficient veneers) that add up to increased profit in the dental practice. In this Veneer Month post, Dr. Brady points out a blind spot that many dentists may be neglecting. The old adage still holds true: ‘Time is money.” Even saving a paltry minute during a veneer preparation can add up over a fiscal year and increase your profitability. Managing a successful practice requires a certain amount of precision in even the smallest details, right down to the quality of a single dull bur. Do you find yourself having to work unreasonably hard to prepare the tooth? The diamond is dull or there is debris clogging up the surface. Don’t waste time or risk injury using a bur that doesn’t cut as well as it should. I suggest finding a way to decrease the amount of dull burs you come across on a regular basis. You’ll work faster and notice decreased wear and tear on both your hand piece and your hand. In this situation, not only do we want efficiency, we want an easy solution. I’ve wavered between the immediate simplicity of single-use diamonds versus the durability of multi-use. Single-use diamonds have an extensive list of downsides that make them less than ideal (as a personal preference). You may not have to train any of your team members to maintain their quality, but you will also have to use many more to make up for the compromised manufacturing. Single-use can also make for a frustrating material in the case of preparing multiple teeth. The loss of cutting efficiency after usually only one or two preps makes single-use diamonds irritating during upper anterior veneer cases or an entire quadrant of dentistry. 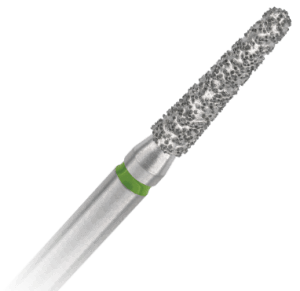 Next week, Dr. Brady will end Veneer Month on the blog with Part 2 of this post on diamonds and burs. She’ll explain her own process of utilizing multi-use diamonds.